Sovereign Home Improvements is a family run business set up by brothers Matthew and Lewis in 2016. Their ambition is to become the best company in the south-east for all Home Improvement needs. From day one they have set out to give their customers an unparalleled level of service and quality from the first meeting and throughout each project. Using the latest in technology, we have the option to give our customers the highest energy rating products to help reduce your energy costs and are also the most secure locking systems to increase your home security. A large part of our business is our window and door service. This covers products such as Windows, Doors, French doors, Patio doors, Bi-folding doors and Roofline. All the above products have 10-year guarantees (insurance backed) along with Police approved locking systems. Our experienced window fitting teams have over 30 years experience in fitting Windows and Doors and we will ensure your work is left clean, tidy and to your absolute satisfaction. The second part of our business is the ever-growing Building division. We offer a complete package for anyone looking to undertake a project at their home. Our architects will work with you to produce your perfect solution for you. Furthermore, our teams of builders are ready to take on any project given to them. We dedicate a lot of time to make sure we get every single detail for each building project agreed, prior to work taking place, ensuring the customer gets exactly what they want. Understandably, many new customers, quite rightly expect to see customer reviews from previous clients before instructing us. As such, we are registered with many of the leading reviews sites including CheckATrade.com and Which? Trusted Trader and Yell.com. 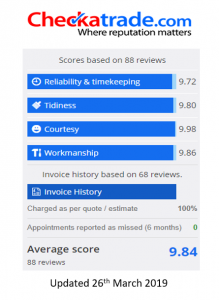 And we ask ALL our customers to give us their honest feedback about the experience they have had with Sovereign Home Improvements. Finally, our office staff are always on hand to help with any questions ensuring that all your concerns are answered before any work commences.